Amplify Ku-band signals for satellite uplinks with unprecedented signal quality and efficiency. Solid-state amplifiers outperform competing technologies. Traveling wave tubes have a significantly longer boot time and, since the tube is an inherent a single point of failure, an unpredictable lifespan. 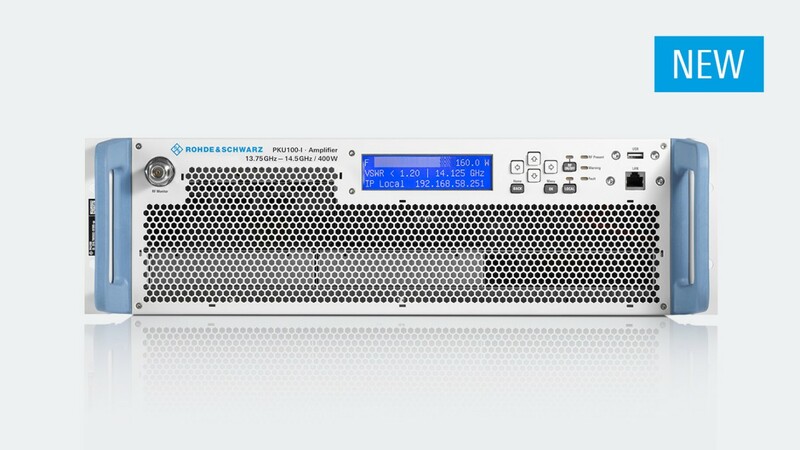 Rohde & Schwarz uses innovative, in-house amplifier technology to raise performance expectations. It is redefining how adaptive linearization improves signal fidelity and amplifier performance. This adaptive linearization works with both L-band or Ku-band input signals. The new R&S®PKU100 solid-state power amplifier for Ku-band satellite uplink applications will soon be available as an indoor and outdoor model. Based on solid-state technology, these amplifiers offer adaptive linearization to improve shoulder attenuation at the amplifier output. All amplifiers feature a previously unattained efficiency and compact form factor. Check out our solid-state, highly rugged and efficient RF power amplifiers.